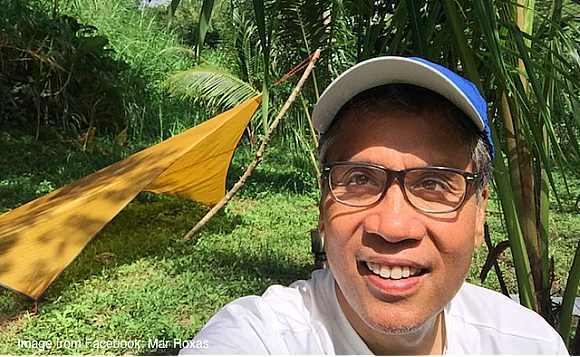 Former Interior and Local Government Secretary Mar Roxas recently traveled to Tanay province for some camping fun. “Went camping yesterday in Tanay, at a place called Jungle Base Camp. It’s really peaceful and pretty there, and only two and a half hours away from Manila. Sharing some photos I took!” Roxas wrote on Facebook. Roxas unfortunately forgot to pack camping food and just settled for leftovers from a burger joint. “Sa seryosong camping, dried fish or meat ang ulam. Nakalimutan ko magdala kaya eto…tira sa breakfast, ulam sa lunch! Hot rice, egg, and sausage – bliss! #ItsAWow” he said.